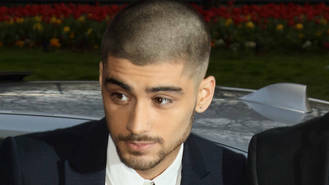 Pop star Zayn Malik is mourning the loss of his "beautiful" grandmother. The former One Direction singer took to Twitter on Wednesday (06Jan16) to confirm the sad news, after rumours began circulating his gran had died following an Instagram post by his sister, Waliyha Azad. "Thank you for your support and love... My grandma was a beautiful person and will be missed dearly." he wrote on Twitter. The 22-year-old's fans were quick to respond, with the hashtag #ZaynStayStrong trending on the social media site minutes later. His supporters were first made aware of his grandmother's passing when his younger sibling shared a touching tribute on Instagram, alongside a throwback photograph. "R.I.P to my grandma I love you more than anything in the world my angel," Waliyha wrote. "It was so hard to see you struggle the way you have been but I know your (sic) in a better place now with my granddad he'll be so happy to see you after so many years." In the flashback image, Zayn's grandmother can be seen smiling alongside his mother, Trisha, and a man believed to be his late maternal grandfather. Zayn has had a tough 10 months since leaving the boy band in March (15), and signing a solo record deal. On 4 August (15), it was confirmed the singer had broken off his engagement to Little Mix star Perrie Edwards, and he set the gossip world alight in November (15) when he started dating model Gigi Hadid after she split from Joe Jonas. Malik was also mired in social media spats with collaborator Naughty Boy and his former bandmates. At least his love life is back on track - reports suggest Zayn and Gigi have been apartment hunting in New York, with a view to moving in together. Guns N' Roses have confirmed Slash and Duff McKagan will rejoin the band for Coachella Valley Music and Arts Festival. Sam Smith is set to party in Benidorm for his father's bachelor party this summer (16), according to an insider. 5 Seconds of Summer star Luke Hemmings is glad he no longer has to hide his love for girlfriend Arzaylea after fans discovered the singer is not single. Stevie McCrorie is "nervous" about how people will react to his debut LP 'Big World'. Miley Cyrus and Liam Hemsworth's alleged romantic reunion has been going on for several months, according to a report. Motorhead could top the singles charts following the shock death of frontman Lemmy. Mark Ronson’s Uptown Funk might have been released nearly two months before 2015 began but it has still clinched the title of biggest-selling song of last year. Rapper Future has hit out at his ex Ciara, accusing her of having "control problems" and stopping him from seeing their son. Guns N' Roses have been confirmed to headline Coachella Festival.